LONDON - FRIDAY 4th APRIL 2014 - TWICKENHAM STADIUM. The whole day was inspirational and I will be using all ideas at some point. · Thoroughly enjoyable, original and inspiring day. · Such an inspiring and motivating training day! · A brilliant CPD course. I have such a wealth of ideas to take back – Thankyou, a thousand times over! · Such a refreshing day. I am feeling creative again after a stressful term! · A brilliantly planned and delivered day, will be using lots of these ideas in my planning next term. 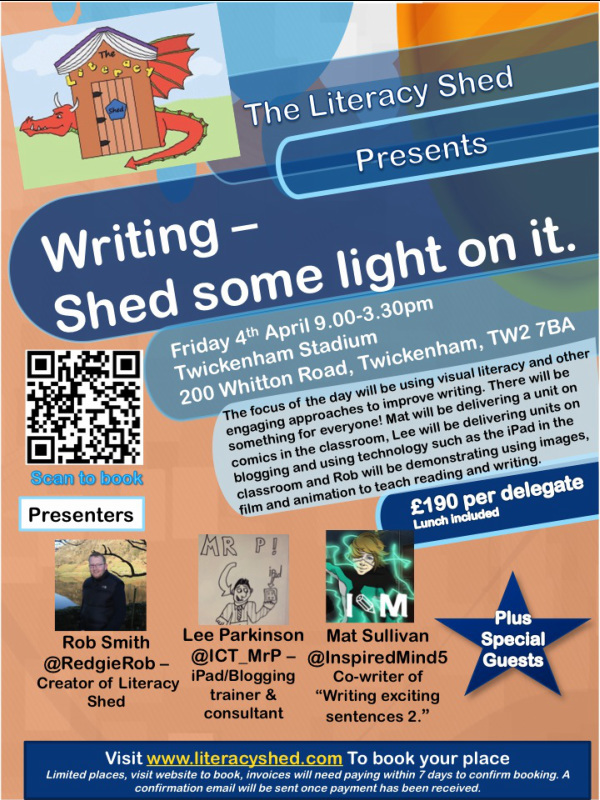 · Great conference, some fab ideas for the classroom to take back and share. · I’ve never been so excited to do my planning! · Fantastic!! Thank you for so many inspiring ideas. · Amazing day – Thankyou! · A very inspiring course with so many practical ideas – where to start from!? · Well worth it! Thankyou! A Fab day! · Great day – very informative. Especially enjoyed the information about the apps and will be trying a few out. Thankyou! · Amazing ideas to take back to school. · Very Inspiring – ALL of you!! · A great day, would want you to come into school. · Brilliant – so glad I came and thanks for creating the literacy shed which staff use regularly. · What a brilliant day! · Really brilliant day, thanks so much! · Would love the chance to see all 3 of you guys teach. · A fabulous day – very inspiring. The best course I have ever been on. · An inspiring day from start to finish. I am inspired and raring to get back to school and try so many ideas out. Thankyou. · All fab – can you all come to CAIRO for a whole school PD? · Very inspiring, a wonderful insight into up to date tools and techniques. · Great ideas that you can take back to school and use immediately. · Excellent day – can’t wait to get back to school to try it all out. · Loved it and I feel confident that I can go back to my head teacher and report that we have done the right thing investing in iPads for almost all of our 500 pupils. · Fabulous day, great useful ideas to take back to school. · Energising, inspiring, relevant – and that’s just me! Wait ‘til I take it to the children. Many thanks to you all. · A highly enjoyable and useful day – kept me engaged on the last day of a long term with so many useful ideas. · Excellent – knew straight away that the day would be solid regarding learning outcomes. · Humorous, engaging, terrific ideas. · Really interesting, looking forward to trying these ideas out. · Inspirational! Totally brilliant – have had such a fantastic day! · Brilliant, the videos ‘Catch’ and ‘Rite of Passage’ will be great for my rainforest topic next term. Just brilliant ideas. · Such useful ideas – great that we’re not ‘the children’ and made to do all the activities. · Haven’t used the literacy shed before so was good to see how it can be used in the classroom. · Really interesting stuff! Lots of new ideas. · Very clear with loads of good ideas. · Good ideas for scaffolding learning using literacy shed videos. · First rate classroom practice shared with enthusiasm and practical knowledge. · Amazing, inspirational – maybe we could arrange an inset for the whole staff! · Really Inspiring – an amazingly useful resource. · Fab! Will definitely be using lots of these ideas. · Humour, accuracy and some fab ideas. · Inspirational and extremely useful. · Excellent ideas, easy to take away and instantly use in class. · Really varied content which can be easily applied. · So much to take in but I am inspired! · So much to take back to school! · A wonderful resource to use in school. I use it lots already. Brilliant to get some new ideas. · Great ideas, fab presentation. · Fab – I am a KS3/4 teacher and I teach largely low ability/mostly boys. Can’t wait to get on with it. · Gave new ideas on how to set stories using ideas that children will be interested in especially low level children. · Very inspired will be planning a topic on superheroes in the summer term. · Excellent, can’t wait to try out ideas. · Wonderful ideas for further use of comics. · Really interesting ideas and clear examples. · Excellent – fun ideas to appeal particularly to reluctant writers. · Great personality, fantastic resources and ideas. · Some really practical things to take straight back to the classroom. · I am a comic newbie so need to check this out more thoroughly. · Some great ideas to use in classroom that are practical and can be used across different areas. · Some great ideas and inspiring. · Have created comic strips but never thought of using them for planning and moving writing on. · Great inspiration for use of iPads and blogging. · Great ideas, with real examples! · Liked the planner – some interesting ideas. · Great ideas, thank you. · Great writing by children – love the vocabulary ideas. · Inspiring, which ideas can I use first? · Very impressed – some great ideas and apps that can integrate into the classroom at foundation stage. · Lots to think about and take away to explore further. · Fab! Love your blog and used so many ideas, so much to take today. · WOW! I cannot wait to set up a blog for my class. · Wow – such great stuff to do! · Really useful and inspirational ideas for using technology in the classroom. · So much amazing work... inspired to create work around saving the rainforests similar to the whale work that Lee has already done... so many new apps to buy. · Loved these ideas but will have to work on getting my head around the technology. · School doesn’t currently have iPads but it wants to be more forward with this, some great ideas to take back. · So many examples to take back – inspired to blog – thank you! · Great, as with all speakers, a real passion for learning. · Absolutely inspirational! I am going to make an effort to learn how to use apps now. I didn’t realise what a brilliant tool they are for contextualising learning. · Inspirational, now to learn about blogging! Can’t wait to try out some of the fab ideas. · Can’t wait to try out and hope I can be half as successful. · So many great ideas, can’t wait to get started, will be looking at the Apps over the holidays. · Can’t wait to try out green screen filming. · I thought I would struggle to stay awake post lunch but I am BUZZING! · Not a single iPad in my school but still inspired. · I will need to translate to KS3/4 but the skills are constant. · Excellent – great ideas. · Inspiring – keep it up! · Very entertaining, especially for younger children. · Great but can he translate to Y7 and Y7+ workshops? · Very entertaining, great use of poetry. · Great presenter but no ideas to take back? More of a sell! · Lovely light refreshment before the ‘Graveyard’ slot! · Woke us up after lunch! · Loved poet... welcome after a filling lunch and got us back in the mood.